Many fans were quite surprised when The Last Jedi revealed Rey's parents in such a nonchalant fashion, especially when The Force Awakens director J.J. Abrams had said in the past that there was a specific reason why Rey's surname was never revealed. Many think that The Last Jedi reveal, crafted by writer-director Rian Johnson, was a red herring, and while that may or may not be true, Simon Pegg, a longtime friend of J.J. Abrams who plays Unkar Plutt in the new Star Wars movies, revealed that Abrams originally had much different plans for Rey's parents. Here's what Pegg had to say in a new interview below, joking about who he thinks is Rey's father. "Well I know what J.J. Abrams kind of intended, or at least what was sort of being chucked around. I think that's kind of been undone slightly by (The Last Jedi). I don't know. I don't know (laughs). I think Unkar Plutt is Rey's real father. There was some talk about, you know, a kind of relevant lineage for her. But I honestly don't know, and I don't know if anybody knows. We shall see." Unkar Plutt was first introduced in The Force Awakens, the junk dealer on Jakku whom Rey sells parts she finds to, in order for her to survive. When Rey had her "Forceback" after first touching Luke Skywalker's lightsaber, she saw herself as a child being left in Unkar's care, as her parents left Jakku. 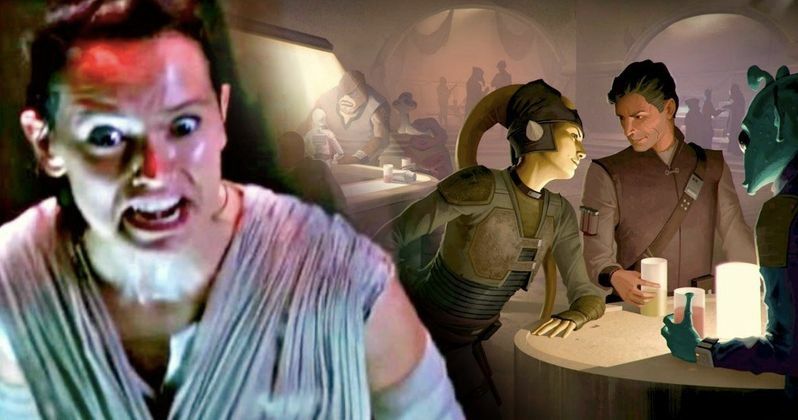 Whether or not we see Unkar Plutt again, or learn more about Rey's parents in Star Wars 9 remains to be seen. But Pegg did say he helped work on the script for The Force Awakens, and added that he has become less passionate about Star Wars since he has become involved in the franchise. "When I saw The Force Awakens I had an odd sense of ennui during it. I felt kind of disappointed and I couldn't figure out why. It ended at the premiere and I felt down and I was like, 'Why do I feel down?' And I realized it was because I'd been in it, I'd read the script, and I'd even contributed a little bit to the script here and there, so I'd been involved in it so it wasn't a big surprise. So I watched the movie knowing everything that was gonna happen, so when that big thing happens to one of our favorite-ever characters, it wasn't a surprise. I realized that the payoff for being in it was to have the experience of seeing it removed, and I wouldn't swap that because it was an amazing experience, but it was a strange one." Simon Pegg has a wide-ranging interview on the Happy Sad Confused podcast. It also includes his thoughts about Quentin Tarantino's Star Trek movie and future collaborations with his Three Flavors Cornetto trilogy partners Edgar Wright and Nick Frost. He also discusses his work on the Mission: Impossible franchise, Edgar Wright's work on Baby Driver and much more. Hopefully we'll find out more about Star Wars 9 as we get closer to production starting this summer.